This week the “Loving Island Life” blog is again being hijacked by Sonja’s assistant, Karen. I knew I had to write this week’s blog to celebrate a very special award our team has received recently. 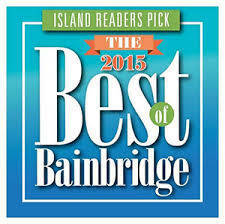 The local newspaper (Bainbridge Island Review) on Bainbridge Island, recently awarded their “Best Of Bainbridge Island” categories for 2015. With a special “Thank You” to our Island friends and neighbors, Sonja was voted “Best of Bainbridge Island Realtor 2015, 2016, 2017, & 2018”! Terrific clients and a special focus on customer care have made this possible and we thank you all. Working as Sonja’s assistant has been such a great experience for me. Her professionalism, high ethical standards, and years of experience have been inspiring and educational. Our personalities clicked when we first met, and we share a passion for total client care, continuing long after the sale. We find it so rewarding that many of our clients are now also close friends. Outside of work we share a passion for our dogs, the natural beauty of the Pacific Northwest, and the occasional glass of fine wine. I feel lucky to be her assistant, and proud to call her my friend. If your goal is to find the Perfect home on Bainbridge Island, call or click today, and let’s get you moving! For more information about Events and things to do on Bainbridge Island, our Real Estate Market, Bainbridge Island Lifestyle, Condominiums, Luxury Waterfront Homes, Equestrian Properties, and Estates and Farms, visit www.homesforsaleonbainbridgeisland.com. Discover what “Loving Island Life” is all about!